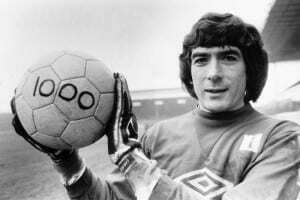 Up there with the likes of Gordon Banks, Pat Jennings was one of the best ever British goalkeepers. The Northern Irishman calmly commanded his penalty box with ease. Despite being a late starter, with a lack of training, Jennings was a natural. He won a record number of caps for Northern Ireland and played in over 1,000 top-level games. A career in football was somewhat unexpected for Jennings: he had assumed he would continue his work as a forester in his home town of Newry (Ireland). But his journey to the top began when Watford signed him as a 17 year-old in 1963. After one season Tottenham signed the youngster. 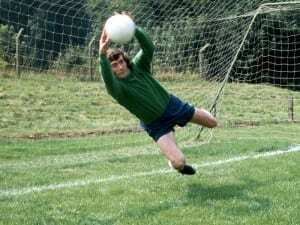 In 1967, the goalkeeper scored in the Charity Shield, lobbing Manchester United’s Alex Stepney from a clearance. The element of surprise was characteristic of Jennings; he could pull off unbelievable saves breaking the heart of many fine strikers. August 1971. Pic via Mirrorpix. ‘Big Pat’ spent 13 years at Spurs, winning the FA Cup in 1967, the League Cup in 1971 and 1973, and the UEFA Cup in 1972. He cites manager Bill Nicholson as the biggest influence on his career. In 1977, after 591 appearances for Spurs, the then boss at White Hart Lane Keith Burkinshaw, decided Jennings' best days were behind him and allowed him to join North London rivals, Arsenal. Yet Jennings proved Burkinshaw wrong: he spent 8 years with Arsenal, helping them to win the 1979 FA cup final in a 3-2 victory against Manchester United. Jennings made 119 appearances for his country. During the 1982 World Cup final in Spain, Northern Ireland beat the hosts 1-0 and it was their trusty keeper who kept the Spaniards at bay. Three years later he kept a clean sheet against England, with his outstanding reflexes, which meant Northern Ireland received the draw they needed to make it to the 1986 World Cup. In total, the Irishman participated in the qualifying stages of six world cups between 1966 and 1986. It was on the international stage he enhanced his reputation, proving to be Northern Ireland’s most reliable line of defence. 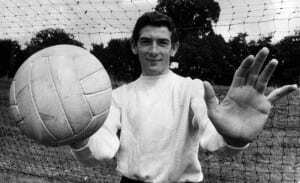 Pat Jennings Arsenal goalkeeper February 1983 holds a football with the figure 1000 after making 1000 appearances in first class matches. Pic via Mirrorpix. His glittering career spanned an amazing 22 years during which time he built up a reputation as one of the world’s best goalkeepers. It’s testimony to Jennings talent and personality that he is much loved by fans of both Tottenham and Arsenal.